Everything from quiet and private spots, all the way to crowded bars and party clubs and lounges, and everything in between; Las Terrenas has a place for any mood you're feeling. Las Terrenas has been a well know culinary paradise for a few years now, mostly thanks to the French, Spanish and ltalian settlers who rapidly set their own restaurants and bakeries. The location and its unparalleled marine supply quickly opened the doors for a new culinary experience, one that integrated the European tradition and merged it with the island's products and recipes. Las Terrenas is not only famous for its beaches, it is also notorious for its rich gastronomical offering. Las Terrenas has over 70 restaurants in town; many from world-renowned chefs that have chosen to retire in Las Terrenas and set up shop there. It’s been the shelter for Chef Gerard Prystasz; former chef of President François Mitterrand, owner of one of the top restaurants in town, Atlantis, right by Playa Bonita. Cuisine such as French, Italian, German, American, Mexican, Dominican, and so on. Las Terrenas has a mixture between mediterranean and western cuisine, but also, our delicious homemade Dominican cooking. Right by our residences, sharing the Playa Bonita beach, Atlantis has been a long time favorite of Las Terrenas. It is owned and operated by Chef Gerard Prystasz; former chef of France's President Francois Mitterrand. The Atlantis offers French cuisine adapted to local products. “Haute Cuisine!” ...the menu is truly exquisite, featuring exotic ingredients and creations, good wine list. 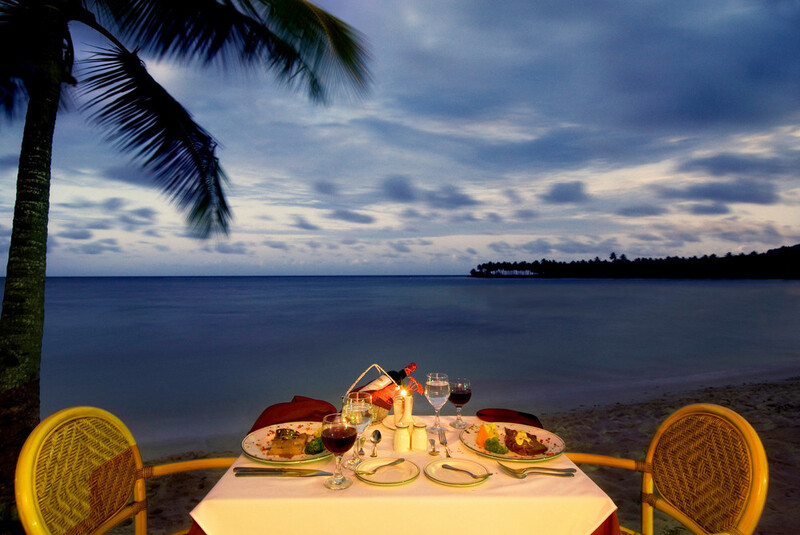 This is a perfect setting for a a quiet or nice romantic dinner. Is a new and exciting restaurant owned by a Chilean settler who arrived a couple of decades ago. XO is conceived as a tapas bar,where you can delight on crab wraps, scampi, ceviches, carpaccios, razor clams, tartars, and many more. XO is their wine cellar where Sandro will personally advise on what wine will blend in better with your food of selection. A local favorite. Luis Restaurant is a hut on the beach surrounded by about 40 tables. It is an experience in itself to be able to eat right in front of Coson beach and watch the fishermen bring in the Tuna´s and Mahi Mahi. It is a very inexpensive place where people come and eat seafood, mainly BBQ lobster, fish and shrimps. One Love Surfshack: Canadian breakfast, thick and juicy burgers. Sports bar, late night drinks. La Tre Caravelle: Italian, International. The Beach: Imaginative and authentic French. El Lugar: Great steaks! Organic, Grill, Gastropub. Porto: Elegant restaurant on the beach. International cuisine. La Terrase: Romantic, elegant French cuisine. A must go to place for dinning and nightlife is the Fisherman´s Village. This spot used to be a cluster of small huts where the local fishermen came in with the catch of the day. Later, these huts turned into small restaurants and bars, and today they conform the heart of Las Terrena´s dinning and nightlife. At the village, you can enjoy an amazing meal right in front of the sea and later stroll into the bar next door for drinks and late night dancing. Like every other town in the Dominican Republic, we have beaches, great music, great culture, and a specially active nightlife, full enjoyment all night long; fun guaranteed. We have all sorts of bars, clubs and lounges. We have Gaia Nightclub for dancing all night long, house and techno, lots of latin music too; bachata and merengue, salsa and mambo and so on. You need a more relaxed and chill environment? You have La Bodega bar, La Locura Bar and El Lugar and One Love works perfectly as a quiet normal bar until 12 to 1:30 in the morning, it will turn drastically into a raving club full of life, music and party! Gaia: Located in the Fisherman´s village, Gaia is the only real night club in Las Terrenas. It is comprised by a 3 storey building where normally each floor will be playing a different kind of music. A favourite for special events and long weekends when the small bars can´t hold the crowd. It is somewhat atypical for the small town because of its air conditioned halls and bright lights, but inevitably attracts party people from all over.